Also reinforcing this "small town" feel is Shapiro's fantastic use of language. She paints each page with turns of phrase that sparkle: the running water of a stream sounds like "nature's bells"; a band's music is considered "dark and kind of swampy"; a man hanging from a noose resembles "a bag of sand, an old metal bucket lowered down a well". "Shelagh Shapiro spins characters that are brilliant, colorful strands, then deftly weaves these into a moving story of family. The family in question, however, is a small Vermont town. Shape of the Sky follows its residents and visitors as they plunge into one particularly eventful summer." "Much of Shelagh Shapiro's stirring novel transpires in the shadow of Mt. Witness. How appropriate the name! This narrative is "local," then, "regional"– but only in the sense that Robert Frost's poetry was. Firmly rooted in Vermont, the book witnesses a whole array of worlds, from the musical to the sexual (ribald or mordant, or tellingly both at once). Yet above all, it dramatizes and testifies to the always complex and always intriguing intricacies of how we deal with one another as human beings." "At the center of Shape of the Sky, Shelagh Shapiro’s brilliant novel about the effects of a Grateful Dead-like concert on a small Vermont community, is the murder of a young woman, but this is not just a murder mystery—if it’s even a murder mystery at all. Shapiro’s true subject is a much larger and deeper mystery, the mystery of human interrelatedness. Formally, the novel’s twelve chapters mimic the so-called “circle of fifths,” the clock-shaped representation of the interconnections between music’s twelve major and minor keys. Each chapter explores the effect of the concert and its surrounding events from a different character’s perspective, and the result is a powerful, in-depth portrayal not only of the interrelatedness of everyone who comes together for one fateful weekend in Resolute, Vermont, but of the interrelatedness of all of us who share this planet under the blue and beautifully ragged circle of sky. And although the concert brings death to the community, it also brings love, hope, reconciliation, redemption, and, ultimately, peace. Shape of the Sky is that rarity, a work of literary fiction that is also a page-turner. Do your heart, mind, and soul a favor and read this wonderful book." 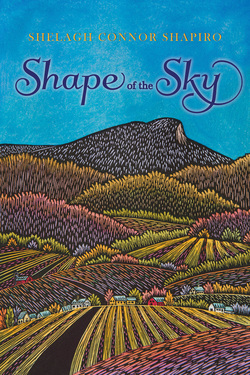 Shape of the Sky gives life and voice to the interstate towns that are often passed over in literature, in favor of countless novels set in New York, LA, or really any town with a population over 700. The setting further forms through Shelagh Connor Shapiro's often gorgeous writing. Imagery is one of the consistent strengths of Shape of the Sky, with words and metaphors that surprised and delighted me. Shape of the Sky, unlike what we'd expect, is not about the clash of cultures and belief systems a wealthy rock band and its diehard fans have with a pristine rural community. It is a vehicle for careful character study during the time when a new event acts as a fulcrum of change for many of the characters, in a place that acts as a witness to it all.